What can a Professional Organizer do for me that I cannot do on my own? I do not doubt your capabilities at all. Sometimes people can just get so overwhelmed by their situation that they find it challenging to get started or complete a project on their own. 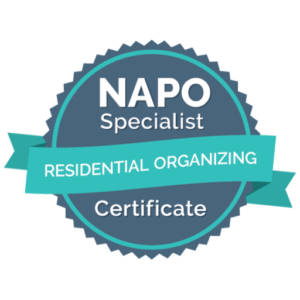 A Professional Organizer can utilize their knowledge, training, and experience to provide the fresh prospective, motivation and assistance necessary to get the job done. I am embarrassed about the condition of my space, why should I let you in to see it? 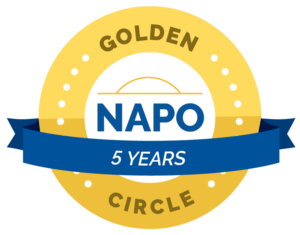 First and foremost, please rest assure that as a member of NAPO, with nearly two decades of experience in the field of Human Resources, I work with a strong sense of honor, integrity, and confidentiality in order to service my clients in the most fair, non-judgmental, and respectable way possible. I understand that in today’s world, the expectations of work and home have become increasingly demanding, making it challenging to maintain balance between the two at all times. A suggestion would be for us to start in a disorganized area that you are least embarrassed about. If you are comfortable and satisfied about how that process went, we can continue with other areas that require more work. 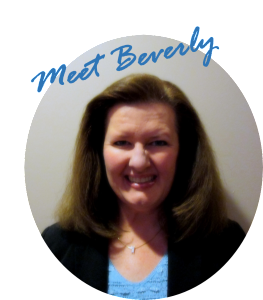 It is important that you do not clean or organize the area prior to my initial on-site assessment visit, so that I can obtain a realistic picture of what isn’t working versus what is working and can determine an appropriate organizing solution that will work well for you. 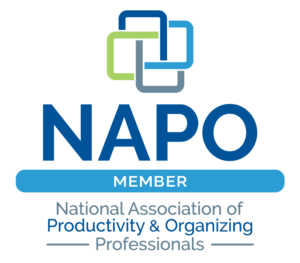 Do I need to be present during the organizing process? Yes. This process is not just about organizing your space, but is also about teaching you how to organize a space that works best with your schedule, habits, and daily routine, so that you can maintain that organized space easily going forward. What organizing products do I need to purchase before the first appointment? None. We first need to sort through your belongings in that space and determine what you want to keep versus what you may want to donate, sell, or discard. We will then assess what types of containers and other organizing products you may already own that can be re-purposed and determine if any other organizing solutions need to be purchased. Will you pressure or force me to throw away any of my belongings? No. 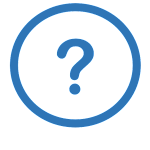 I will certainly ask questions and provide input along the way, but the decisions about what to keep, donate, sell or discard are completely yours. How long will the organizing process take? The time it takes to organize a space is dependent on multiple variables, such as the type/size of the space, the condition of the space, the pace at which you can make decisions about what to keep, donate, sell, or discard, etc. I will work with you to ensure the process is as efficient as possible. Will you post photos of my space on your website, Pinterest, or Facebook page? Photos of your space will only be posted with your approval and will not have your name attached to them. If you prefer that photos of your space do not appear on my website, Pinterest, or Facebook page, I will honor your wishes, no questions asked. I recommend that we do still take before/after photos, even if only to show you the progress that was made over the course of the project. I charge by the hour. Please call for current hourly rates. Payment is due at the end of each session. I accept cash or checks.